In this blog, we introduce Type Conversion Functions. In the earlier blogs of the Comprehensive Tableau Reference Guide blog series, we have covered Logical Functions, Number Functions and Date Functions. These blogs are easy-to-read and particularly helpful for Tableau rookies who want to develop a foundational knowledge about the Calculated Field fundamentals. 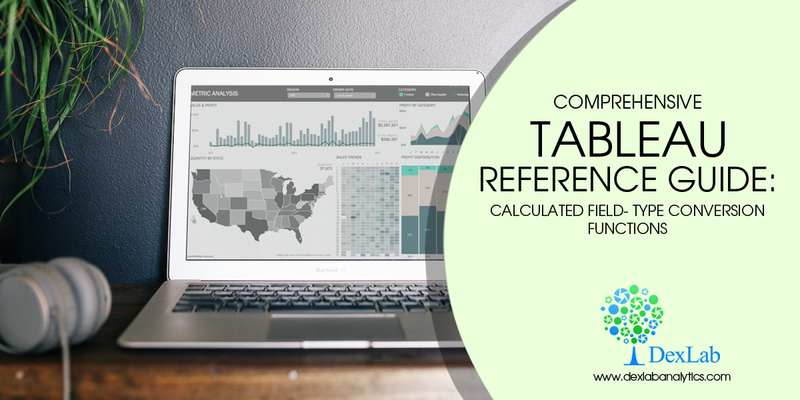 These step-by-step guides are perfect for Tableau enthusiasts who want to understand how and when to use the various functions available in Tableau’s calculated fields. Today, we will explain Type Conversion Functions. This group of functions enables users to change the data type of fields. You can convert the result of an expression to another data type. For example, using the Type Conversion functions, you can convert numbers, like age values, to strings. These functions are useful when the underlying data source needs some groundwork to harness the full potential of your visualization. These functions are uncomplicated and easy to understand. So, let’s dive right in! With the help of these functions, you can convert the result of arguments to different data types. For instance, if you want to make certain that all the values within date fields are date or datetime data types, then Date function and Datetime function comes very handy. Want to learn about all the amazing features available in Tableau? Follow DexLab Analytics– we are among the leading institutes providing Tableau certification in Delhi. To know more about our Tableau BI training courses, visit our website. Check back for previous blogs where we have covered some essential Calculated Field functions.